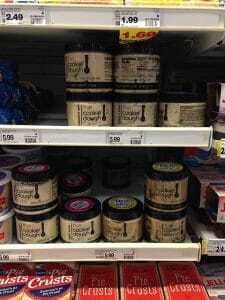 Packaged FINDINGS: Cookie Dough Café Packaging Stands Out but Does it Deliver? In keeping with the mission of this blog, I am always looking for something new and different on shelf. This time, I came across something unusual in the dairy case section. In with the eggs, butter, and premade pie and cookie dough I found jars of what I will call “faux dough” – a new product from The Cookie Dough Café. What caught my eye was the container. 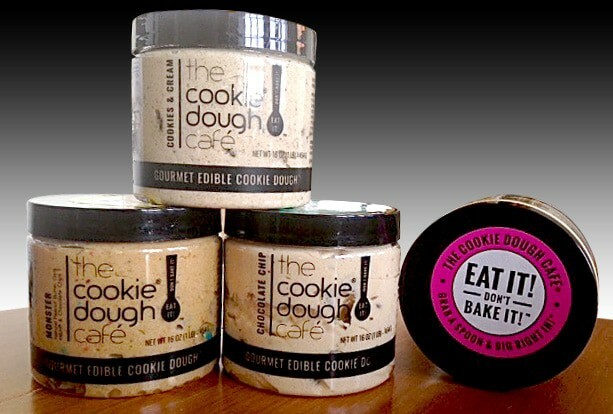 Without a doubt, the packaging was different from other tubs, tubes, and packs of pre-made, pre-shaped cookie dough. I immediately thought it was a “gourmet” product. However, this is also where things began to fall apart. Sometime s it is beneficial to design packaging that displays actual product to the consumer as a part of the design concept. Think marinara sauce, fruit, cheese or meats. In this particular situation where design is built on exposed product, the bland beige of raw “dough” does not create a compelling image, especially with multiple containers stacked side by side. The single color graphic design system is reliant upon black typography that becomes totally absorbed in a field of beige product. Brand consistency and continuity in packaging design is essential and in this case, there is a consistent brand image on all packages, but that is as far as it goes. The design system lacks any color, icon or design trigger to differentiate the four flavor styles offered in the product mix. I am a naturally curious person, so I wanted to understand more about this product, however, the lack of messaging made it difficult – it says that it is edible cookie dough, but it is not really cookie dough and it does not contain dough ingredients. And, although it is located in proximity to pre-made cookie dough products, you can’t make cookies with it. Large, bright stickers on the jar lids draw the eye to the lid with the bold message EAT IT Don’t BAKE IT. So how does a person consume this product? Are you supposed to eat it by the spoon right out of the jar, dish it out and serve it like you would pudding or ice cream, or use it as a spread? The packaging needs to go much further in communicating why this product is different and why the consumer should buy it; to better tell its story, including how to use it. If it was created to deliver a little taste indulgence, could a single serve size container be a better delivery vehicle for the product as opposed to an entire jar? Clear packaging can work to your advantage. Talenti® frozen gelato uses a very similar packaging approach, based on a single color, type-heavy design grid organized in a strong linear communication structure. They benefit from the immediate visual link between the color of the product and its flavor, with flavor copy supporting Talenti® branding. In the case of The Cookie Dough Café, the eye does not flow naturally through package messaging, forcing the consumer to read back up through and perpendicularly to seek out flavor differentiation. At the same time, negative space created by air pockets formed by packing dough in the jars creates dark pockets making branding harder to read, further diminishing its impact. Keeping things simple and direct is always a sound approach, and in this case, I believe with some simple reorganization and prioritization The Cookie Dough Café package could be made to work much more effectively.